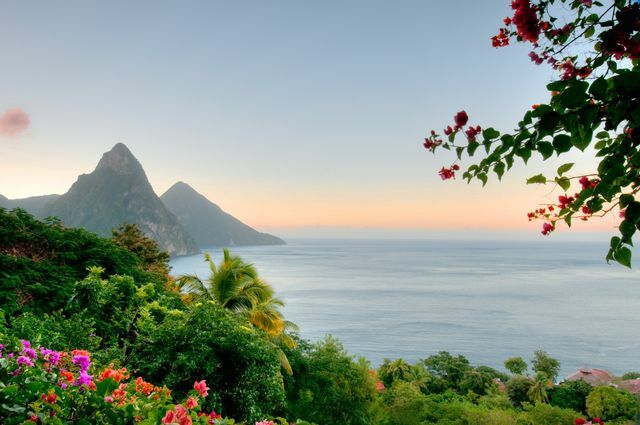 Set against the majestic twin volcanic peaks of The Pitons and blessed with white sandy beaches along its never-ending coastline, St. Lucia honeymoons have been a favorite for some time. The island nation’s thriving landscape of volcanic plugs, dense rainforests and lush green jungle, disturbed only by cascading waterfalls, provides the active couple with a variety of hiking trails and climbing terrain. For those who wish to indulge in the languid pace of island life, a St. Lucia honeymoon is ideal. The island's pristine beaches beckon its honeymooners to bask in the sun and snorkel in its sparkling blue waters before retreating to one of the island’s many luxury resorts. A saunter through the sleepy fishing villages and open air markets of Castries offer an insight into daily life on the Caribbean island. Learn more about this beautiful and romantic island, and see why St. Lucia honeymoons are so popular. The winter months of December through May present the best time to for a St. Lucia honeymoon due to warm and dry weather for outdoor activity. Soaring prices during this season are a consequence of the influx of tourists. June through October marks hurricane season on the island, resulting in increased rain, heat and humidity, leaving St. Lucia relatively quiet this time of year. Gros Piton: A strenuous hike to the summit of Gros Piton is rewarded with a sweeping panorama of the south of St. Lucia. Gros Islet: This town is most notable for its lively street party every Friday night known as Jump-Up, where St. Lucia honeymooners can relish in authentic Caribbean street food and groove to the beats of reggae and R&B amongst others. Diamond Botanical Gardens: St. Lucia’s oldest botanical garden features pathways flanked by lush green vegetation that lead to its roaring Diamond Falls. Castries Market: Experience the hustle and bustle of the capital city’s largest open air market and sample authentic Caribbean dishes as you mingle amongst fresh and locally grown soursops, eggplants, fresh fish and curry spices. Anse Chastanet: The crystalline waters of this beach render it a top-notch location for snorkeling and scuba diving during a St. Lucia honeymoon. National Rainforest Tour: An action packed gondola and zip wire tour through the enchanting rainforest of St. Lucia is particularly appealing to individuals interested in bird watching and observing exotic flora and fauna. Pigeon Island: Pigeon Island is witness to the historic battles between the French and British for possession of St. Lucia, leaving behind partially intact military buildings and cannons. Rodney Bay: A central hub for St. Lucia’s visitors, honeymooners relax on Reduit Beach by day before kicking it up a notch and exploring the happening bars and nightclubs by night. Marigot Bay: The beautiful backdrop to the 1967 classic film, Dr. Doolittle, Marigot Bay’s blue waters is a visitor favorite for water activities including yachting, scuba diving and deep sea fishing. Roseau Banana Plantation: Learn about the importance of the industry to the island and the process of banana cultivation on St. Lucia’s largest plantation. Sulphur Springs: A visit to the Caribbean’s sole drive-in and once active volcano reveals the fascinating history of its current geothermal processes and creation of surrounding mud baths. Spices Cooking Studio: Led by talented home cook Jenni Killam, delve into the Caribbean culture as you learn to master caramelized bananas with rum, and accra amongst other favorite Lucian dishes, all while sipping on homemade rum punch. What a fun and unique St. Lucia honeymoon activity!